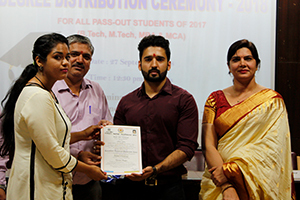 The Rajasthan Institute of Engineering & Technology organized the ‘Degree Distribution Ceremony’ for the 2017 batch of Btech, Mtech, MCA & MBA batch of students on 27.9.18 in the college campus. The entire team of pass out students of 2017 assembled for this auspicious occasion. The chief guest on this occasion was Mr Abhishek Singh who is the MD, Amma Chandrawati Hotel & Resort (Blackout Lounge and Godenoak Hotel) and also Chairman, Bhoomi Vikas Bank, Bharatpur, Rajasthan. Mr Abhishek Singh is also an Alumni of RIET, he is 2008 year pass out. 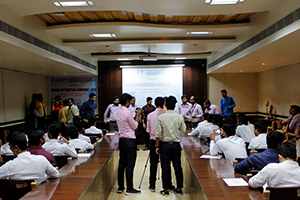 The honored chief guest and the awardee students were welcomed by , Principal RIET, Dr Saroj Hiranwal, Dean Academics & Admin, RIET, Prof. Kapil Dev Sharma and Vice Principal, RIET Dr Sachin Sharma,. The session was attended by all HODs, and faculty members of RIET. Principal, RIET, Dr. Saroj Hiranwal, addressed the gathering and welcomed the chief guest. 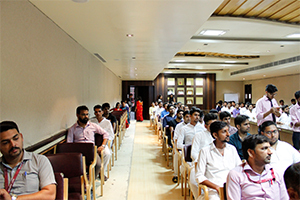 She addressed the engineers and encouraged them to follow their profession with zeal and passion. 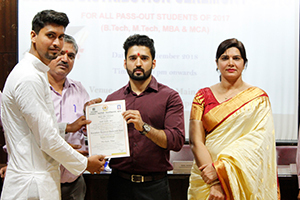 The chief guest on this occasion Mr Abhishek Singh distributed the degrees to all the students and also addressed the awardees. 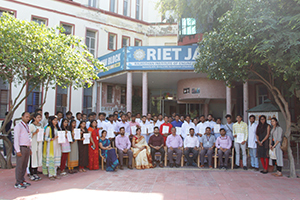 He added that all our former students have made all of us proud by their distinguished work in numerous capacities therefore they are an inspiration to all the young and budding technocrats of RIET. 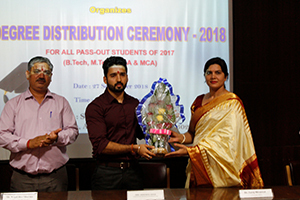 Their alma mater feels honored by felicitating its students on this ‘Degree Distribution Ceremony’. He wished all the students present and Alumni all success in their endeavors. A High tea was served to all the awardees and guests. The day ended with the patriotic national anthem sung in unison by all present.